The Smithsonian American Art Museum is looking for the baddest Pac-Man hand in the land. 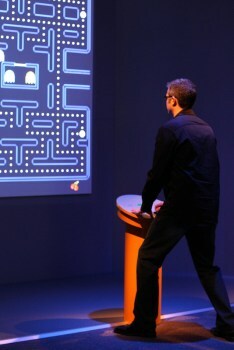 If you've got some serious old-school Pac-Man chops and you're going to be in Washington D.C. on August 4 - that's the first Saturday of the month - then you might want to present yourself to the good folks at the Smithsonian American Art Museum, who are looking for up to 50 people to take part in the Art of the High Score: Pac-Man Edition. The Art of the High Score is actually a tournament the museum is holding as part of the summer's Art of Video Games exhibition, which began in March and runs until the end of September. Registration for the tourney opens at noon on the big day, and is free to enter on a first-come, first-served basis. Gameplay begins at 12:30 pm and runs until 5, with each player given a maximum of four minutes to rack up the highest score possible. When the dust settles, the top two dot-gobblers will be awarded "awesome" (and, for the moment, very secret) prizes. The same day, the museum is also hosting Museum Quest, an alternate reality game being run by Streetpass DC. Participants will be tasked with undertaking quests like defeating "wandering monsters" and photographing "hidden treasures," with prizes awarded to those who complete all their tasks. Players will need to bring a six-sided die and something capable of taking and displaying photos, and can fly solo or work cooperatively, and even get help from parents if they're part of the younger crowd. It sounds like not the worst way to spend a day, so if you're going to be in town and need something to do, you can get all the details about The Art of the High Score: Pac-Man Edition from the American Art Museum and find more information about Museum Quest is up on Facebook.